The government of Armenian Prime Minister Nikol Pashinyan is undertaking a wide-ranging legal assault against members of the administration he toppled, with a number of high profile arrests in recent weeks. Members of the old guard, meanwhile, have been fighting back behind the scenes in the apparent hope that they can eventually regain power. Six relatives of former President Serzh Sargsyan, as well as his bodyguard and a member of parliament from his Republican Party, have been charged with felonies by the National Security Service (NSS) over the last month. The authorities have at times highly publicized the investigations: The NSS televised its search of the apartment of Alexander and Narek Sargsyan, the former president’s brother and nephew, respectively, where they found cocaine, amphetamines, and guns made of gold. Another nephew, Hayk Sargsyan, was charged with attempted homicide, and the former president's bodyguard Vachagan Ghazaryan was arrested on suspicions of illegal enrichment after the NSS tracked down $3.1 million of unknown provenance in his bank account. Several other top officials have been ensnared in a separate investigation into the events of March 1, 2008, when security forces fired into a crowd protesting Sargsyan's first election, killing 10. In that case, the Special Investigative Committee has accused former Defense Minister Mikael Harutyunyan of “usurping state power,” subpoenaed former President Robert Kocharyan and questioned former Defense Minister Seyran Ohanyan. This flurry of arrests and investigations has led to suspicions that the purge is politically motivated; while few doubt that those being prosecuted committed crimes, the speed with which the prosecutions are coming raises doubts as to their legal basis. Pashinyan has brushed off allegations the investigations are politically motivated. “We are not going after anyone’s family or individual, we follow alerts that law-enforcement bodies receive as well as the information that they have,” the prime minister told RFE/RL's Armenian service. His defenders point out that the crackdown is only the most visible element of an ongoing power struggle between the new and old regimes. While Pashinyan and his team control part of the executive branch, Republican loyalists continue to hold positions and strong influence in most of the rest of the state apparatus. People loyal to Sargsyan “continue to control municipalities, the prosecutor's office, all courts, all election commissions and local criminal groups that helped them falsify elections,” Hovhannes Igityan, an Armenian political commentator, told Eurasianet. Many suspect that the old guard is carrying out a deliberate sabotage of the new government's efforts, from trying to scuttle a new election law – one of Pashinyan's key promises – to spreading alarmist information in the media. One senior government official, speaking to Eurasianet on condition of anonymity, said the Republican party leaders “are very active in their efforts to undermine us, but they’re wasting their time.” The official added that, unlike the former-opposition-turned-current-government, the old guard is not skilled at operating without the full control of the executive branch. “I sleep well at night,” the official said. Igityan pointed to the municipal government in Yerevan, whose Republican mayor, Taron Margaryan, has been a major target of the new government and its supporters. One investigative report, produced by Pashinyan’s advisor Aren Mkrtchyan, showed lavish houses and apartment buildings allegedly owned by the mayor. After the report went viral on social media, Margaryan effectively stopped working, Igityan said. “After the report was published, Margaryan abandoned his job and was running around hiding his assets,” resulting in Yerevan residents experiencing issues with trash pickup and other city services. Margaryan's resignation, while a victory for the new guard, nevertheless presents a challenge: An extraordinary session of the city council to elect a new mayor will be held July 16. Pashinyan and his allies have been trying to delay elections until they and other friendly political forces can get organized to compete. Sargsyan loyalists also are able to continue to wield influence through the media. Zolyan of the Regional Studies Center said that he had lately been noticing “conspicuously similar-looking messages consistently repeated in certain media outlets and by certain social media commentators.” One example, he said, was alarmist rhetoric surrounding Azerbaijan’s activity on the border with Armenia and Nagorno-Karabakh. “It’s being implied that there’s a growing danger of war, and that Nikol [Pashinyan] and his team are ultimately ignoring national security issues,” Zolyan said. “The problem is that some of the mainstream media are still controlled by [Sargsyan’s son-in-law] Mikayel Minasyan,” said Andreas Ghukasyan, a former presidential candidate jailed under Sargsyan. 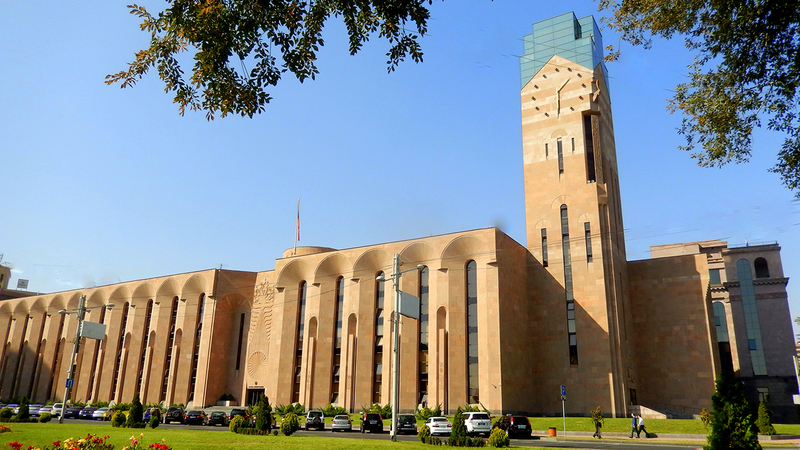 The PanArmenian Group media group, for example, manages a number of TV and radio stations, as well as some of the biggest digital news outlets, and is widely believed to be controlled by Minasyan. Speaking on condition of anonymity, a senior PanArmenian executive confirmed to Eurasianet that the group is controlled by Minasyan. “The media ownership poses a risk of information manipulation,” said Ghukasyan. Some of the old guard members have links to Russia that could protect them from prosecution in Armenia. Since 2009, former President Kocharyan has served as a director for Sistema PJSFC, one of Russia’s largest investment companies. His son, Levon Kocharyan, reportedly has ties to the son of Russia’s Minister of Internal Affairs Vladimir Kolokoltsev. Harutyunyan, the former defense minister, also holds dual citizenship in Armenia and Russia, and is registered in an apartment complex on Moscow's Rublevskoe Highway built for Russian officials. The Russian constitution forbids the extradition of its citizens. Despite his concerns about sabotage, Igityan said he believes the Republican Party's attempts to hang on to power are doomed. “They think they're leading a political struggle, but it’s just prolonging the misery,” he said.